The world became brighter on November 20, 1969 due to the sunrise of Philip Joseph Ward being born to Arlene Cofield and Kenneth Ward Sr. in Wilmington, DE. He was the younger of two boys. “PJ” as he was called as a young child was raised in a firm but loving home and most importantly, one that worshipped and revered God. His aunt remembers him being inquisitive and needing answers immediately. His Biblical training came from Bethel A.M.E. He excelled in everything academic and athletic (soccer and track) through Concord High School. Philip received a full scholarship to University of Delaware where he majored in chemical engineering and later earned an MBA. There, he experienced things that helped him grow into the man we knew and loved. He pledged Alpha Phi Alpha Fraternity Inc. Xi Omicrom where he developed a tremendous gift for mentoring that he embraced throughout his life. He also played intramural basketball and sang in the R&B group called Rejuvenation. He was also an active member of R.I.S.E. (Resources to Insure Successful Engineers). The early 90’s was an age of spiritual maturity which brought about many calls: A call to return to Bethel with whole hearted involvement. Ms. Gloria Oakley saw the seeds of musical notes she sowed as a child grow into fruition as Phil became a skilled composer and cantor. While at Bethel, he served on many ministries, which include: Bethel Voices of Light, The Bethel Quartet, Men’s Chorus, Young Adult Network and a mentor of Thursday Club and the Delaware Conference YPD. He then was called to minister the unadulterated Word of the Lord under the guidance of his spiritual father, Rev. Dr. Silvester S. Beaman. He had a way of exchanging the most complex wording in the Bible and making it sound like a simplistic conversation that translated to it’s barest essence - Jesus did it for you because He loves you point, blank...period. would be Jaiden’s first understanding of a Father’s love...His love. She truly was a Daddy’s girl. For Phil – or Philip Joseph as he was known in the music industry – singing was no hobby or fly by night activity. Phil felt there was nothing more powerful than communicating with people through song. He wrote his first song at the age of eleven. Phil has shared the stage with international artists such as Al B. Sure, Myles J, Brian Culbertson, Leelah James, Levert II as well as the legendary R&B group - Change. Locally, Phil mixed harmonies with Tracey A, Suite Franchon and the PLP4Life Family, Jazz Jordan and G2, To The Max and Best Kept Soul. Philip Joseph is also noted for the beautiful duets he shared with artists, such as Kim Pinder-Gardner. Phil has also ministered with The Serena Ford Singers, Friends and Spirit for Jazz. Exploring into different genres served him well. In May 2008 he joined the group Del’s Groove as one of the lead vocalist. Whether it be Rock, Country R&B or Gospel he sang with soul. Additionally, he has performed and recorded with Aniya Jazz producing the single “Count Your Blessing” which features Phil on lead vocals. He has collaborated on many musical projects with Soul Sound, MarDay and most recently with Bishop S. Todd Townsend and Mark Vodery. Phil joined Horizon Services in March of 2008. He was hired as a Warehouse Specialist, but it soon became apparent to everyone that he was the “glue” that held the department together. Phil was promoted to Warehouse Manager in 2015 where he managed a team of twenty. No task was too big for Phil to handle. He was proud to belong to the Horizon family and to manage the “Warehood” as he referred to it. Phil was warm, resilient, fearless and side splittingly hilarious. 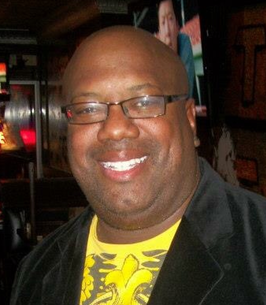 With his infectious smile and personality, Phil was able to engage with anyone he met. He had a way of making people feel as if they have known him all of their lives. Phil lived his life to the fullest, pursuing every dream while helping others achieve theirs: living a life pleasing to the Lord. On Friday, October 12th, the world became a bit dim with the sunset of Phil’s life. The news of his passing was felt throughout the Tri-State area and beyond. His friends and family realized they shared a common experience: The love of Phil. In life and death, he brought people together. Left to cherish awesome memories of him are: his loving wife, Montrell; his daughters, Jaiden and Monica (Jason); grandchildren, Maya and Zoey; brother, Kenny Jr. (Antoinette); in-laws; one god daughter; Janel and a host of aunts, uncles, nieces, nephews, cousins, family and friends - too many to count. 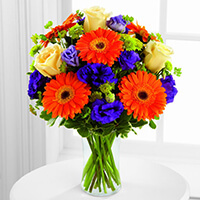 To send flowers to the family of Philip J. Ward, please visit our Heartfelt Sympathies Store. My sincere condolences for your loss may the God of comfort be with your family during this most difficult time. Please find comfort from these words 2Corinthians 1:3, 4 and Isaiah 25:8. Our condolences, prayers, hugs, and kisses to the Ward Family. Phil, see you soon! Praying for God’s peace in your time of Loss. But you can be confident that he is continuing to praise and worship in the presence of our Lord! Montrell and family, please accept my condolences on the loss of your loved one. Please know that I will be keeping you in my thoughts and prayers. May God continue to bless you during this difficult time. Please accept our heartfelt sympathy for your loss. While the journey from sadness and tears may seem endless, God will see you through to the days of smiles when you reflect on the wonderful life you shared with Phil. God bless you and your family. TO MONTRELL, JAIDEN, MONICA, AND FAMILY: MAY YOU FIND PEACE AND EVERLASTING JOY IN THE CHERISED MEMORIES AND EXPERIENCES FROM A LIFE SHARED WITH PHIL.